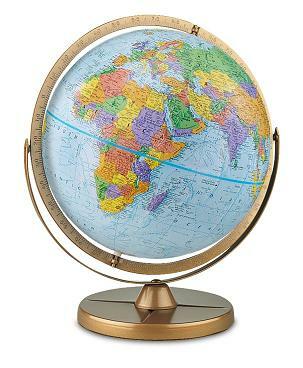 The Pioneer Desk Globe from Classroom Maps AtoZ is designed for hands-on learning and exploration. The map features vivid, contrasting colors to distinguish boundaries. A full meridian with gyro-matic mounting allows students to view all areas of the globe. Plastic base and metal mounting have matte gold finish for cohesive appearance. Backed by a one-year warranty.